Most writers have more ideas than they know what to do with. (Yes, I did end that sentence with a preposition.) Finding inspiration is not a problem . . . except when it is. For me, this usually happens around the 30,000-word mark. I’m happily typing along, letting my characters do what they want to do when the words start to slow down until I click on the keyboard one last time. I describe the feeling as standing on a wobbly rock in the middle of a river. There’s no clear way to the other side and the rocks behind me are under water. I am, for the most part, a big believer in AIC (credit to Nora Roberts). Writing output is directly correlated to time spent sitting at the computer. When I start in the morning, I set a timer and do nothing but write until it goes off. Just doing it works great when it comes to getting writing done. From time to time, however, we face something in our story that doesn’t quite work, and we’re not sure how to make it right. That’s when it might be time to step away. A few weeks ago, I found myself in a hole at the very end of the second Abish Taylor mystery. I spent a few days trying to type my way through it, but got no where. So, I took a break at the Met. Art museums are my refuge. If I can find space away from the crowds, I don’t much care what the exhibit is about. (There, another preposition.) A stroll through Central Park works, too, if the weather is to my liking. I’ve come to believe our subconscious mind sometimes can solve problems our conscious mind cannot. We need to give our subconscious space and time. For me, walking and looking at something pretty allows for just this kind of problem solving to happen. 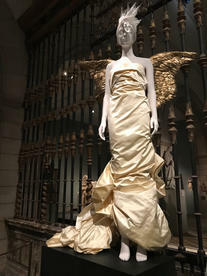 Museums and parks may not be everyone’s cup of tea, but I suspect that everyone has his or her own way of “stepping away.” Find yours. . . . and, if you like museums, are interested in the Catholic Church or fashion, I can recommend the “Heavenly Bodies” exhibit at the Met.